So we just moved and are still exploring our new neighborhood. We moved into a "master planned community" meaning it has 3 elementary schools, a middle school, preschools, doctors offices, restaurants, gas station, markets, etc. It rocks! You never have to leave. It is very popular for young families and we were so excited to get to meet people. 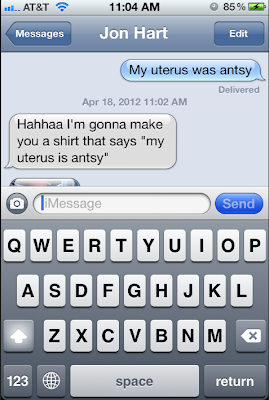 Hahaha after we texted I thought, "I MUST take a picture of this convo"
So why was my uterus antsy? There was a group of little girls playing with their baby dolls afterschool having such a funny conversation, two toddler boys digging in the rocks and pregnant women and mommies holding tiny babies in swaddles...it was baby fever of about 150. I am already nostalgic enough thinking about the house we live in being the house we have children in and now this park?! I was imagining myself coming their everyday with Team Hart in tow and I instantly got to thinking how amazing that will be. N0 I am not pregnant but wanted to share this funny text. Actually...Kristin shared some BIG and EXCITING news yesterday and after I commented "something is in the water" she asked if I was pregnant haha. Nope. But something IS in the water (or on the world wide web) because I can name at least 50 people who are pregnant right now. No lie. Oh and Jon is known for making me shirts with different sayings. Literally. I have at least 5 homemade shirts, starting from the very beginning of our relationship (he made me a shirt that said Taken when he asked me to be his girlfriend). See this post. You will make a wonderful mom Ruthie! Motherhood is the most amazing gift imaginable, you don't know life until you have a baby!!! :) I can't wait to see a mini Hart! bahaha! This is so cute. I'm the same way! Congrats on your fun new house! LOL too funny!!! It would be priceless if he did make you a shirt that said that!!! Glad you are settling into your new neighbourhood! haha too funny, whatever is in the water there is also traveling towards North Carolina because there are a TON of people pregnant here too. 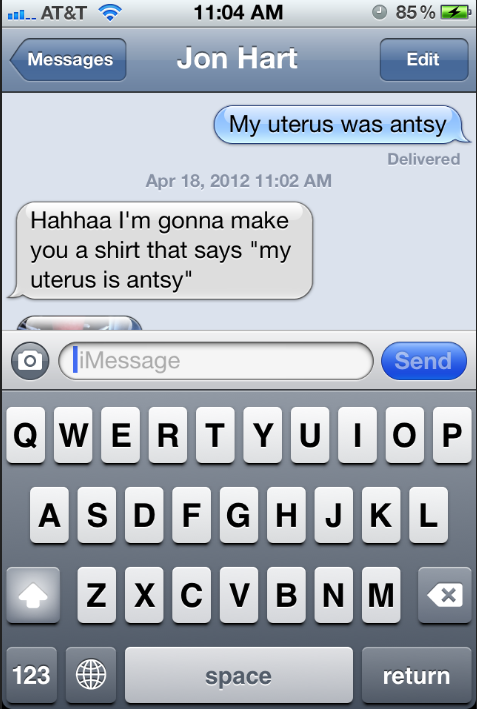 My uterus is now filled with ants, too....ugh I can't wait for that!! 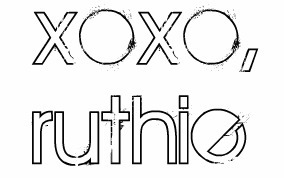 ps- thank you for your sweet comment on my blog this morning! I thought I would be immune to baby fever after I caught it the first time - and then was preoccupied with my baby for awhile but, totally got it again. I'm hoping the fever stays away awhile after this next one though - I can only afford two kids in childcare at once haha. Baby fever is rough! Seriously I remember how my heart ACHED for a baby like it was the one thing that would complete my world. Every time I would see a mom and her baby at Target making goo-goo eyes at each other I died inside. your going to be a great mommy!!! but I do not blame you for having baby fever!!! It is everywhere. Yes! You will be such a cute pregger! And I know that you will be a fantastic momma!! So exciting when baby fever starts! Haha too funny! Have your hubby make a shirt for me too! As matter of fact he should sale them lol. Congrats on your new house! Sounds like an amazing place to raise children. Sounds like you need a good dose of babysitting!!! Amelia is available Mon-Sun from the hours of 5am-8pm :) I am more concerned about being able to take your maternity photos because you would be the cutest preggy EVER! That would make a fabulous t-shirt ~ and a crazy conversation starter ~ HA! I hear you ~ I know so many pregnant women right now including my sister and sister-in-law :) I'm so excited to hold those new little babies!!!! Seriously something is deff in the water did everyone decided to get preggo this year? We are hoping to become home owners this year.. I don’t even want to imagine how much higher my baby fever will get once we finally own a home. New house new baby. Its a fact :) Not to worry that your uterus was antsy, it simply can't be helped :) Team Hart is going to be SOOO cute! You guys are going to be babysitting, barbequing and winethirting your neighbors until you all get to be Real Housewives of Austin. Your neighborhood sounds so wonderful! You are so right - it will be perfect for babies...I'm sure that doesn't help the baby fever though. It sounds like you are really enjoying your new neighborhood! I get what you mean about baby fever although for me, it is puppy fever. and what a sweet hubby you have! i love the idea of making t-shirts. Haha! I hear ya on the baby antsiness. (is that a word? Haha!) every time I see a baby I think "omg! Our baby..." hahahahaha! That would be so funny to have a shirt that said that - hahaha. Just thinking about seeing someone walking down the street with a shirt that said that makes me giggle. I love not knowing exactly what is in store for my husband and I, makes me giddy to know what/when will exactly happen to us!